Nearing the end of March I was hoping to take an entire dedicated day to do my large family once a month grocery shopping for April. I love it when I can make it a special day out and take a kiddo or two (usually whichever one/ones I feel need a special momma day out and more time “under my armpit” as I like to say 🙂 ). We shop our favorite discount grocery store, hit Costco, eat lunch our somewhere special, and get in a stop at the Dollar Tree and maybe the Thrift Store, too. However, April came rushing at us fast, quick, and in a hurry. I had also taken an evening to cook 40 make ahead freezer meals for new moms to split between some momma friends of mine having babies. Their families are younger and smaller than mine so the most I gave one family was 12 freezer meals (I try not to overwhelm, ha!) and the other family ended up with room to take 5 freezer meals. I knew of a 3rd family to give another 5 meals. That left our family with about 18 large family freezer meals to build up our freezer stash after coming off our latest three-week pantry challenge. The dedicated day out to do our large family once a month grocery shopping just wasn’t available in my large family momma world before we *really needed groceries*. 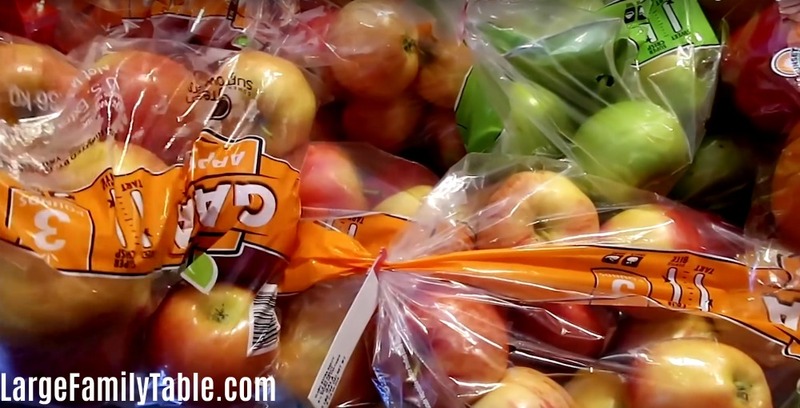 When this happens I opt for my next best grocery-sanity-lifesaver, Walmart Grocery Pick Up! I had ordered the groceries I needed to make the 40 Freezer Meals for Before Baby (for friends!) the weekend before and thought I’d just do it again for our large once a month grocery shopping haul! At some point when my mom was visiting I was also able to get in an $80 discount grocery haul at Sharp Shopper when I was in that city on evening. I only had 30 minutes to snag those grocery deals, but it was a fun run-in shopping trip! I placed my Walmart Grocery Pick Up order on Saturday afternoon and scheduled the pick up for Sunday after church. There were a few items they substituted. All substituted grocery items were within reason and nothing messed up my planned large family recipes or large family meal planning efforts. 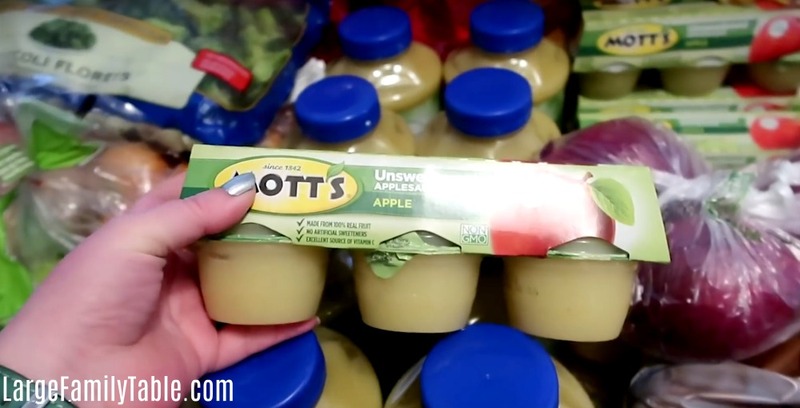 An example of one of the few grocery substitutions is I ordered my standard 12 jars of unsweetened apple sauce. I received 10 of the ordered 12. For the last two they substituted the same ounces owed to me in the last two jars, only in the smaller Mott’s unsweetened applesauce cups (clear as mud?). This worked out well because we had a planned homeschool field trip to Washington DC to see the Cherry Blossoms later that week. I planned to take the applesauce cups as part of our lunch for that trip. Another substituted item was the apples. I ordered two 5-lb bags of apples since we already had a bag or two in the fridge. They ended up giving me four 3-lb bags of apples for a total of 12-lbs. A question I’m often asked is if Walmart substitutes my ordered item with a more expensive item do I have to pay the price difference. No, I do not pay the more expensive price difference. I pay the cheaper price of the item I ordered. Walmart may substitute me *more* of an item (such as 2 extra pounds of apples) or give me the name brand vs. store brand. However, I don’t pay any more for the extra quinty or more expensive brand. Knowing me you know that this new grocery haul includes items for many upcoming freezer meals! About $179 of what I spent on this grocery haul goes towards making 20 new low carb/gluten free and many dairy-free Instant Pot and Slow Cooker freezer meals (see my last go-round of making 50 Keto/Low Carb/ Trim Healthy Mama S-Meals for the Instant Pot and Slow Cooker here). You can be on the lookout for the new healthy freezer meals recipes in the coming week. 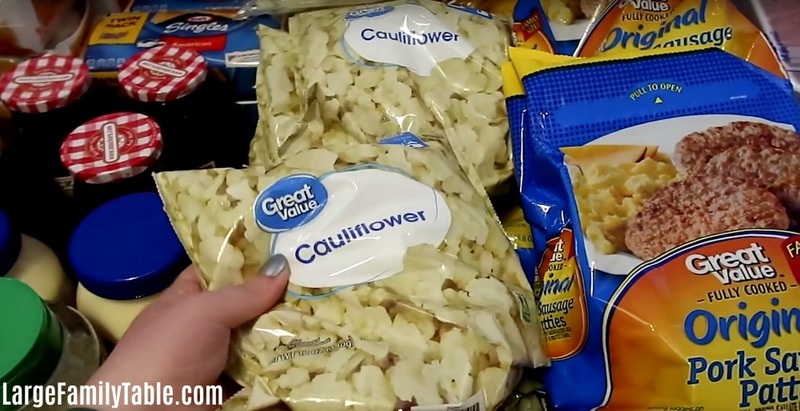 I needed several bags of frozen cauliflower for several recipes. Walmart ordering didn’t have the cauliflower in the 52 oz bag I prefer to buy. Instead I ordered 6 of the smaller 12 oz bags. To compliment all the healthy freezer meals (haha, #foodpolice) we’re also refilling our big stash of freezer sandwiches. I bought 24 loaves of bread to make about 200 or so Peanut Butter and Jelly for the Freezer, Grilled Cheese for the Freezer, and Turkey Cheese for the Freezer, too. 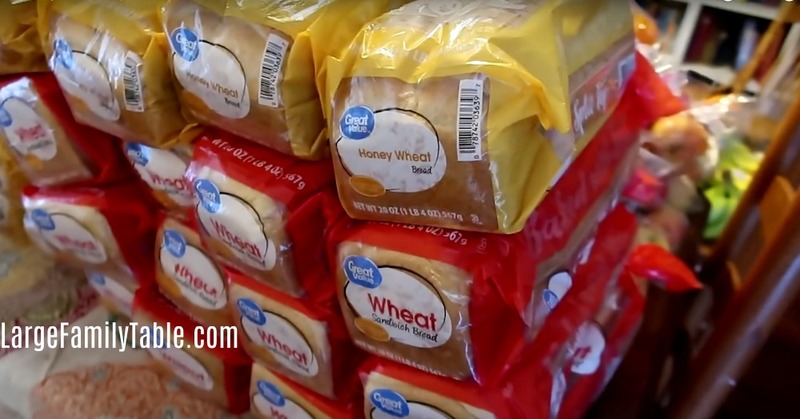 I was also going to have one of the kids’ breakfast meal prep about 70 Sausage Muffin sandwiches for the freezer, too (you can see more of those in this “small” 4-Hour Large Family Freezer Cooking video). And only 8 gallons of milk to get this month rolling, ha! I’ll do a grocery fill-in haul at Aldi in a few weeks to fill up on more milk, fruits, veggies, and anything else needed. Here’s my full list of large family meal plans for April if you’re looking for meal plan inspiration. I share large family dinner ideas, recipes, helps and more! 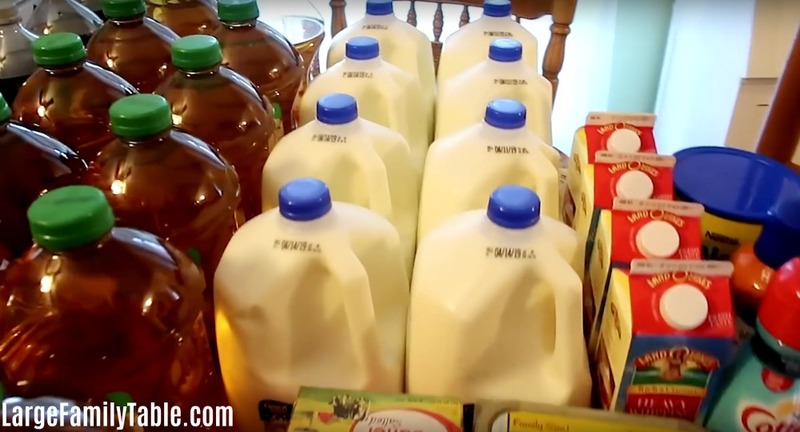 Over on YouTube, you can see my full Grocery Shopping for One Month haul for my large family. 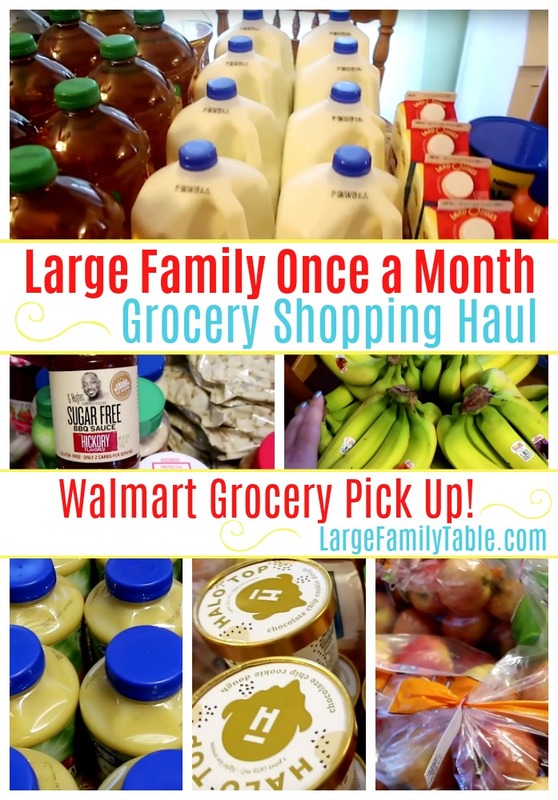 This large family once a month grocery shopping haul came to just under $630 and also includes goodies like a refill of my Halo Top stash (yes, many times I just have a Halo Top for lunch lately! ), apple juice for the kids (treat! ), and more. My large family grocery budget for April is right around $1,000. I also spent around another $200 to $250 on household items such as diapers, soaps, cleaners, wipes, napkins (you got it, anything that we don’t eat). This is for our family of ten which includes three adults (18-year-old son) and 7 children ages 1 1/2, 4, 6, 8, 9, 12, 15, who work from home and school from home full-time. 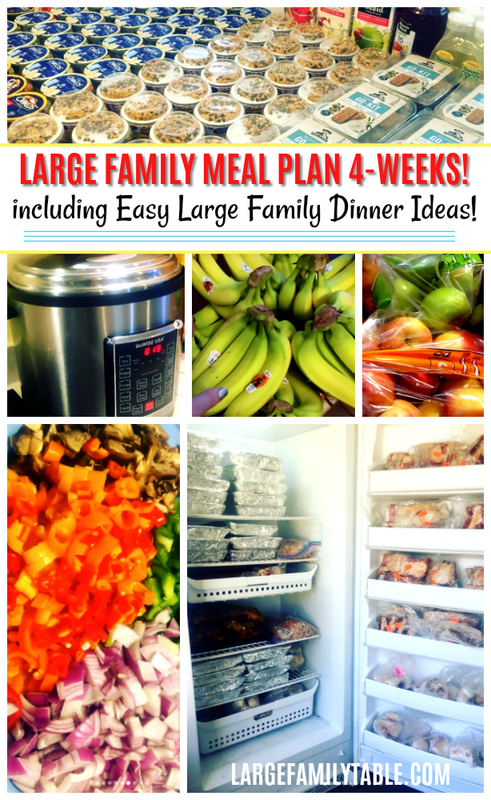 That’s 90 homecooked meals and 60+ snacks for a family of ten for 4+ weeks (you can see my popular large family meal plan for the month here). So far for April, I’ve spent $80 a Sharp Shopper Discount Grocery and $630 on this Walmart Grocery Pick Up Haul. That leaves me around $290 for my fill in grocery haul to get more milk, fruits, veggies, and anything else we need from Aldi in a few weeks. This is a very low cost budgeted grocery shopping haul considering I’m also making 20 healthy freezer meals from it as well! Let me know what you think. 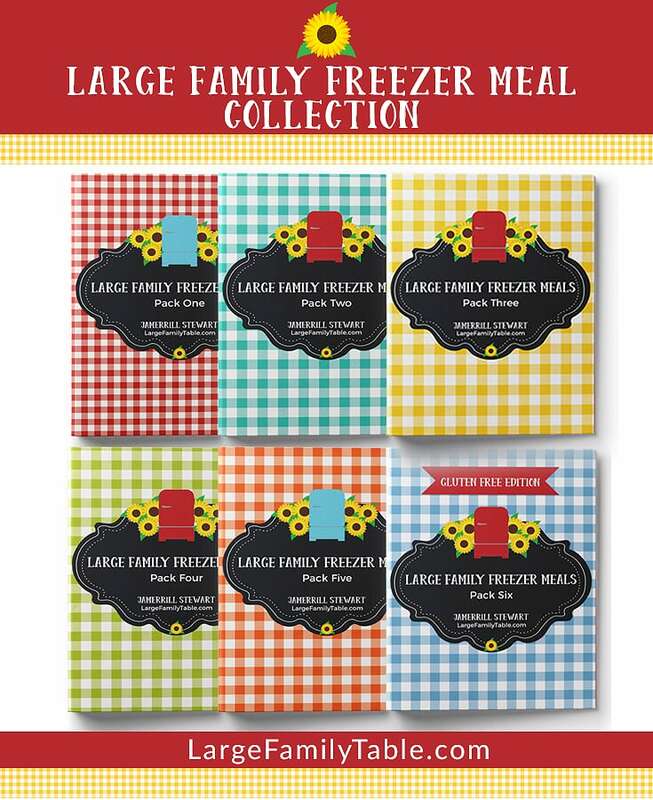 Don’t forget to snag the FREE Large Family Good Collection here while you’re at it! Hi! I just started following you and I love how you food prep. How many refrigerators and freezers do you have? I only have 4 kids but have a hard time fitting 2 weeks worth of Costco food in my refrigerator and garage freezer.